The United States isn’t the only place where smartphones, tablets, and other mobile devices have a growing presence in schools. 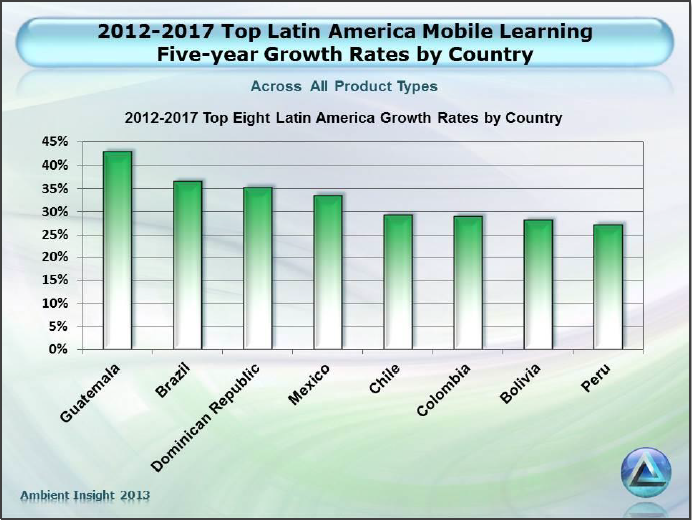 The rate of growth in the use of mobile tools in Latin America, including in its education systems, is likely to soar over the next four years, according to a new analysis. Revenues from mobile device sales in the region are likely to more than quadruple, from about $363 million in 2012 to $1.4 billion by 2017, according to the report, published by the market research company Ambient Insight. The surge in spending will be driven not only by purchases from individual consumers, but also by private academic institutions, and increasingly by public education systems, as “major digitization efforts roll out” across the region, Ambient Insight reports. The ed-tech ambitions of a number of Latin American countries, as described in the report, are mammoth. In Brazil, for instance, the federal government has announced plans to buy 900,000 tablets for more than 58,000 schools. In Colombia, plans were unveiled this year to buy 500,000 tablets for public schools. Also see our recent item about a potentially enormous education purchase being considered in the Brazilian state of Sao Paolo. Perhaps not surprisingly, the most in-demand mobile learning product will be “packaged content,” such as apps. Over the past two years, the market for educational apps has “exploded,” the report says, and apps stores are now opening in locations across Latin America. Other factors are driving the surge in demand for mobile technologies across Central and South America, Ambient explains. Telecommunications companies are adding value-added products, which are in high demand, with their mobile devices. The demand for those products “represents a lucrative new distribution channel for digital education publishers,” the report says. Another factor driving the market for mobile: High-speed networks are becoming more common across Latin American. The establishment of 3G and 4G networks is a “strong catalyst for smartphone and tablet adoption,” the authors say. In fact, mobile adoption in Latin America has been so strong that many users have gone straight to using those technologies, without ever having taken the interim step of owning a personal computer with Web access.